Since its debut, we’ve wished that the new G31 BMW 5 Series Touring would make it to the US market. It’s such a good looking car and is probably the best variant of the 5 Series. In fact, the BMW 540i Touring might be the perfect everyday car. Now, though, there’s a new challenger to the 5 Series Touring and it looks pretty damn good itself — the Audi A6 Avant. So let’s see which one is the better looking car of the two. From the front, it’s really tough to call. 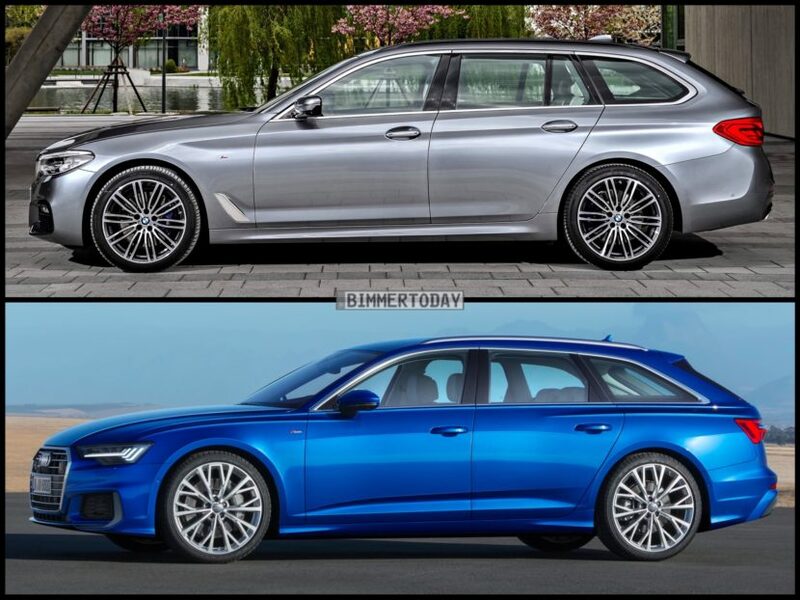 Both are really handsome cars, both have aggressive front fascias (with the 5 Series in M Sport trim, the Audi A6 has that face as-standard) and both have very large grilles. 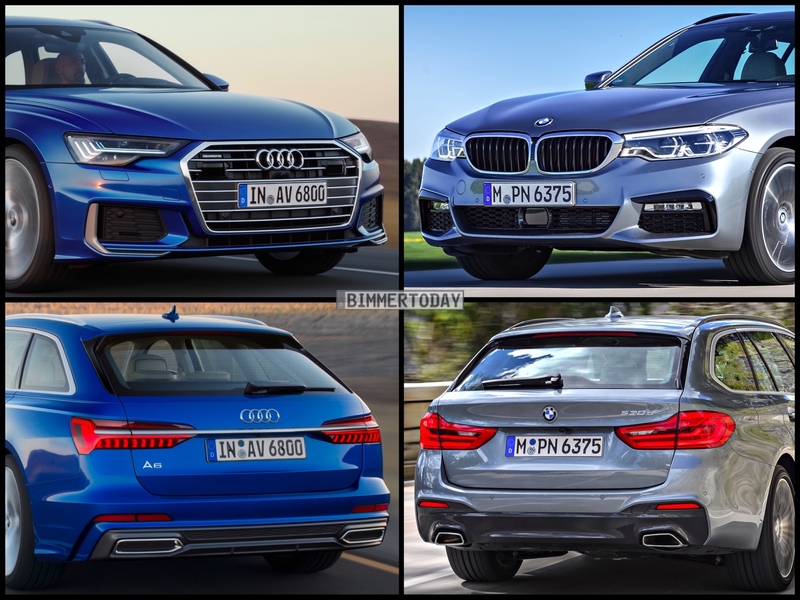 While looks are subjective and you might have a different opinion, I personally like the Audi A6 better up front but it’s by the tiniest of margins. The difference maker for me is the hood. Its creases are so sharp you could cut yourself on them. That really goes for all Audis these days, as Audi is doing incredible metal stamping work. In profile, it’s also very close. Both cars have sharp and aggressive shoulder lines, both have similarly shaped rooflines and D-pillars and both looks muscular. 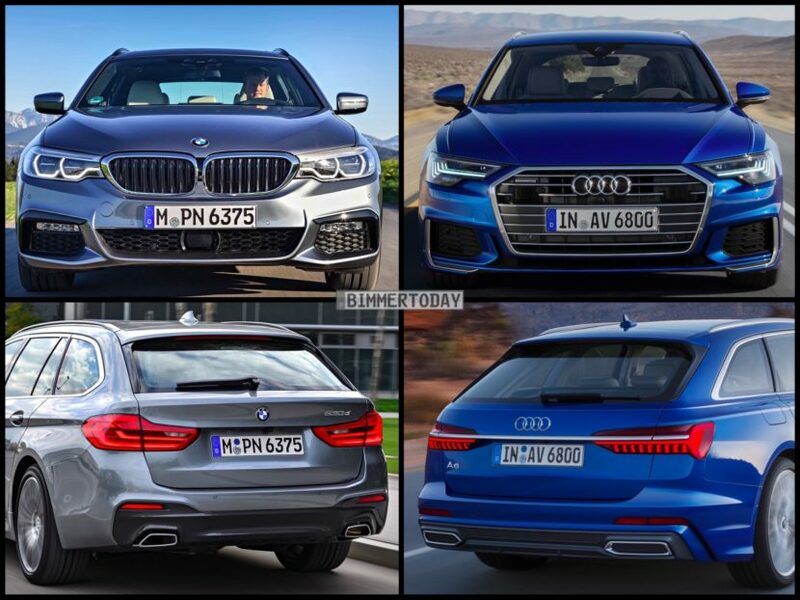 Though, I’m going to have to lean toward the 5 Series, here. I love the way its shoulder line stops at its flared front wheel arch, which gives it a really tough look. It also has a much shorter front overhang, which looks better than the Audi’s longer one. It’s close again, though, as the A6 is a really good looking car as well. Out back, I think the 5 Series is also the more handsome car. The Audi A6 looks really good but its worst angle is from the rear. 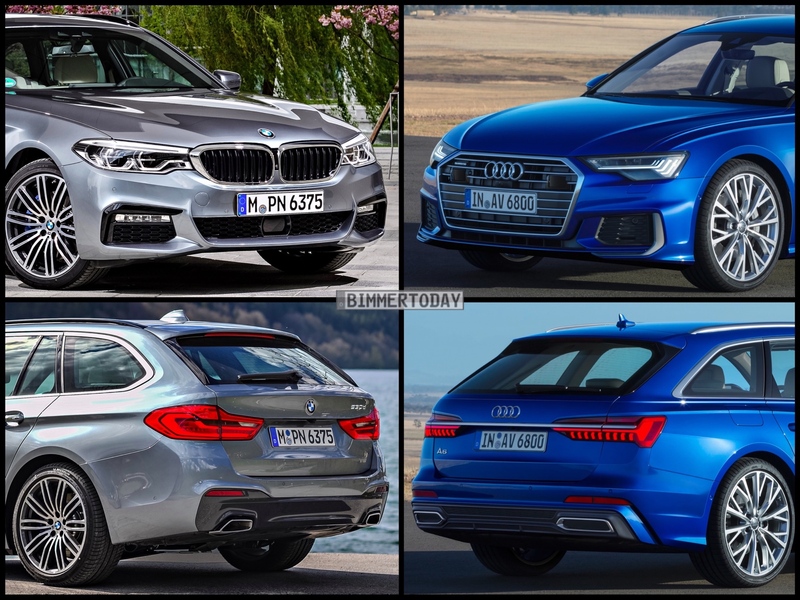 It just looks a bit dumpy compared to the 5 Series and that has a lot to do with the 5er’s little built-in spoiler, if you can call it that. Also, the Audi A6 Avant has fake exhausts and that’s inexcusable. Inside, though, the Audi A6 starts to fight back. The 5 Series has a handsome interior but it’s just not as smart looking as the Audi A6’s. It features a really slick looking dual-touchscreen MMI infotainment system, which works better than we had expected (although, we only used it while parked at the NY auto show), great looking ambient lighting on either side of the center console and probably the best digital instrument panel in the business. Also, I’m personally a big fan of four-spoke steering wheels like that and miss them, as it seems as if every car has a three-spoke steering wheels nowadays. Both cars are great inside, though, and both have incredible build qualities. I give the Audi the nod, though, for a slick-looking, more modern styling. But it’s close. Overall, I honestly don’t know which one I’d choose. I like more about the 5 Series Touring on the outside but I like the Audi A6 Avant’s interior better. So it’s really tough to decide. 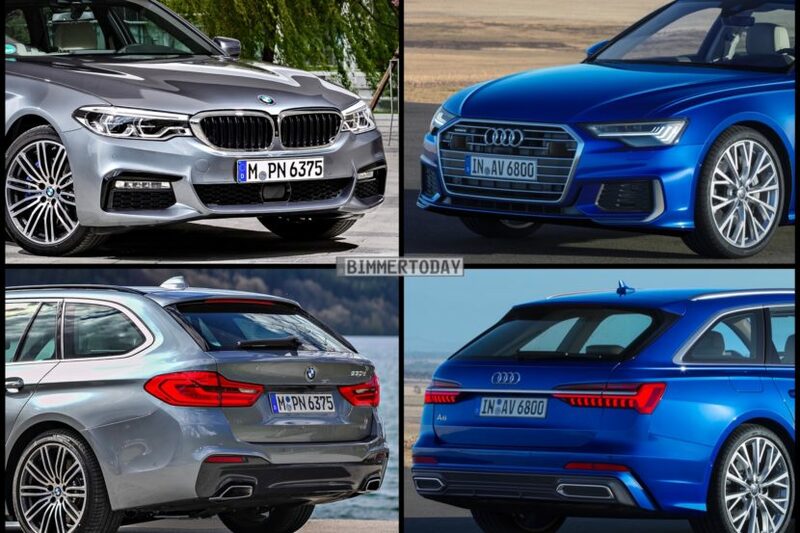 I guess in an unfair way, I have to choose the 5 Series Touring. I know that it’s a great car to drive so I know that I would love to own it. However, we haven’t driven the new Audi A6 yet, so I can’t really say that it’s worse. It’s just unknown. And on that really unfair bombshell, the BMW 5 Series Touring wins.